Hailing from an island of gemstones, Siren of Serendip is one of the world’s largest blue sapphires. This magnificent and unparalleled gemstone will be on display in the Brown Gallery at the Houston Museum of Natural Science from March 3 through 24, just in time for spring break! 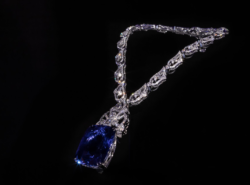 Considered one of the top five sapphires in the world, Siren of Serendip weighs a phenomenal 422.66 carats and was discovered almost a century ago on the island of Ceylon (now Sri Lanka). When found, the original rough crystal weighed 2,670 carats before it was cut and polished. Siren of Serendip is set in a necklace designed and created by Ingo Henn of London and Idar-Oberstein, Germany in 2019. It includes 913 diamonds (totaling 36.30 carats) set in platinum and white gold. Tickets to view Siren of Serendip are $5 (in addition to admission to the permanent exhibit halls). The Siren of Serendip is now on permanent display at the Houston Museum of Natural Science—due to a little serendipity and a large amount of generosity from multiple anonymous donors.